Read-out Instrumentation Signpost: Flexible particle monitoring. As concern grows with the effects of both indoor and outdoor particulate pollution, Air Monitors has launched a new range of advanced monitors, Particles Plus monitors, that improve the flexibility with which measurements can be undertaken. 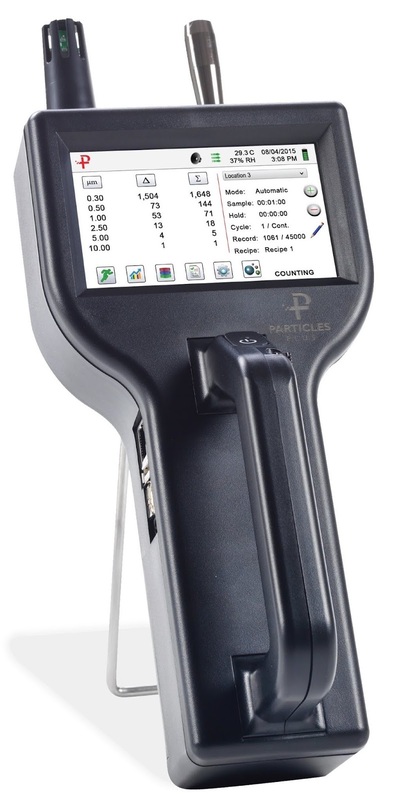 Compliant with strict international standards, the Particles Plus monitors employ a range of patented technologies to simplify the collection of accurate air quality data including particulates, temperature, and relative humidity. The instruments monitor PM1, PM 2.5, PM5, PM10 and TPM (and any other PM size specified by the user) with an easy-to-use Channel Management control panel. Each instrument has alarm capability and also monitors flow, sensor status, date of last calibration, serial number and laser on-time. Particulates are measured by passing the sample through a thin laser beam and scattered light is measured by a sensitive optical detector. The signal is amplified into an electrical pulse, the height of which corresponds to the size of the particulate. The height of each pulse is measured and ‘binned’ according to size and counted, and at the end of the sampling period, the counts in each bin or channel are reported. This provides users with detailed measurement of the size fractions, which is vitally important because of their health implications, and because size apportionment helps with source attribution. A key feature of the Particles Plus instruments is their connectivity – they can be connected to a PC, a router, and the internet via an Ethernet connection. The instruments are also supplied with internal Wi-Fi or RS-232/RS485 capability. This means that users can access their monitors remotely, and also enables remote connection for updates, diagnostics and configuration. Advanced, patented, power management is designed to extend battery life and ensure long runtimes. This is achieved with features such as sleep mode and a lower power profile when idle. Each instrument can store up to 45,000 data records, so at 1 sample per minute, the instrument can record a full month’s worth of data before older records are overwritten. 15 minute sampling would facilitate the storage of more than 15 months of data from up to 1,000 user defined locations. Furthermore, data can be annotated – to note sampling conditions for example. Summarising, Air Monitors MD Jim Mills says: “The Particles Plus monitors are a major addition to our product portfolio, offering customers enormous flexibility in the measurement of workplace and ambient dust and aerosols. With a range of instruments available, we will be able to recommend the best instrument for applications ranging from the heaviest PM pollution to the cleanest of cleanrooms.